ABOUT: Soapy Jones hand make unique looking artisan soap and bathing goodies from scratch, by using the finest oils, butters, and botanicals. The products not only sell well as glamorous bathroom must-haves but also make ideal wedding/party favours and gifts. 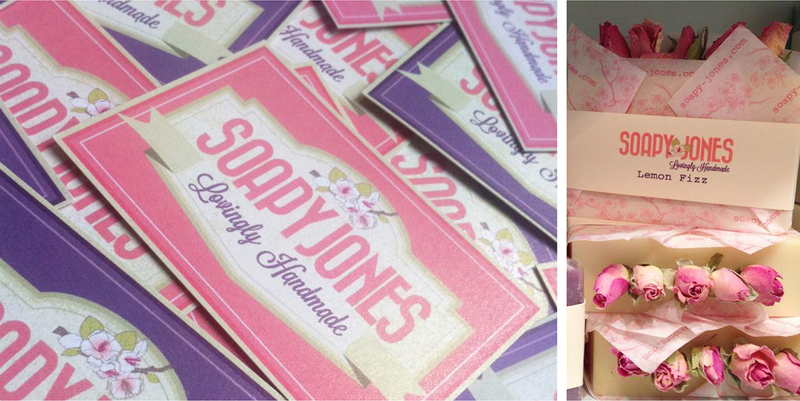 Wendy from Soapy Jones wanted her brand to reflect the fun yet ethical qualities of the soaps, mixed with a vintage twist. Paperknots created a vibrant logo that incorporated vintage elements such as an Art Deco shaped box, framed with ribbon and cherry blossom. Rustic elements were added to portray the natrual ingredients used. Once the brand was established, Soapy Jones wanted the new look to translate across everything they created. Bespoke business stationery, packaging labels and wraps, social media assets and a website were then created to suit.